The Israelites smitten at Ai. (1-5) Joshua's humiliation and prayer. (6-9) God instructs Joshua what to do. (10-5) Achan is detected, He is destroyed. 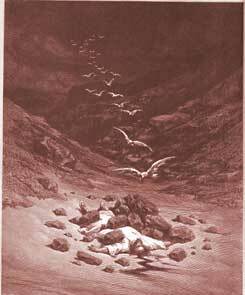 (16-26)1-5 Achan took some of the spoil of Jericho. The love of the world is that root of bitterness, which of all others is most hardly rooted up. We should take heed of sin ourselves, lest by it many be defiled or disquieted, #Heb 12:15|; and take heed of having fellowship with sinners, lest we share their guilt. It concerns us to watch over one another to prevent sin, because others' sins may be to our damage. The easy conquest of Jericho excited contempt of the enemy, and a disposition to expect the Lord to do all for them without their using proper means. Thus men abuse the doctrines of Divine grace, and the promises of God, into excuses for their own sloth and self-indulgence. We are to work out our own salvation, though it is God that works in us. It was a dear victory to the Canaanites, whereby Israel was awakened and reformed, and reconciled to their God, and the people of Canaan hardened to their own ruin. 6-9 Joshua's concern for the honour of God, more than even for the fate of Israel, was the language of the Spirit of adoption. He pleaded with God. He laments their defeat, as he feared it would reflect on God's wisdom and power, his goodness and faithfulness. We cannot at any time urge a better plea than this, Lord, what wilt thou do for thy great name? Let God be glorified in all, and then welcome his whole will. 10-15 God awakens Joshua to inquiry, by telling him that when this accursed thing was put away, all would be well. Times of danger and trouble should be times of reformation. We should look at home, into our own hearts, into our own houses, and make diligent search to find out if there be not some accursed thing there, which God sees and abhors; some secret lust, some unlawful gain, some undue withholding from God or from others. We cannot prosper, until the accursed thing be destroyed out of our hearts, and put out of our habitations and our families, and forsaken in our lives. When the sin of sinners finds them out, God is to be acknowledged. With a certain and unerring judgment, the righteous God does and will distinguish between the innocent and the guilty; so that though the righteous are of the same tribe, and family, and household with the wicked, yet they never shall be treated as the wicked. 16-26 See the folly of those that promise themselves secrecy in sin. The righteous God has many ways of bringing to light the hidden works of darkness. See also, how much it is our concern, when God is contending with us, to find out the cause that troubles us. We must pray with holy Job, Lord, show me wherefore thou contendest with me. Achan's sin began in the eye. He saw these fine things, as Eve saw the forbidden fruit. See what comes of suffering the heart to walk after the eyes, and what need we have to make this covenant with our eyes, that if they wander they shall be sure to weep for it. It proceeded out of the heart. They that would be kept from sinful actions, must mortify and check in themselves sinful desires, particularly the desire of worldly wealth. Had Achan looked upon these things with an eye of faith, he would have seen they were accursed things, and would have dreaded them; but looking on them with an eye of sense only, he saw them as goodly things, and coveted them. When he had committed the sin, he tried to hide it. As soon as he had got this plunder, it became his burden, and he dared not to use his ill-gotten treasure. So differently do objects of temptation appear at a distance, to what they do when they have been gotten. See the deceitfulness of sin; that which is pleasing in the commission, is bitter in the reflection. See how they will be deceived that rob God. Sin is a very troublesome thing, not only to a sinner himself, but to all about him. The righteous God will certainly recompense tribulation to them that trouble his people. Achan perished not alone in his sin. They lose their own, who grasp at more than their own. His sons and daughters were put to death with him. It is probable that they helped to hide the things; they must have known of them. What fatal consequences follow, even in this world, to the sinner himself, and to all belonging him! One sinner destroys much good. What, then, will be the wrath to come? Let us flee from it to Christ Jesus as the sinner's Friend. There are circumstances in the confession of Achan, marking the progress of sin, from its first entrance into the heart to its being done, which may serve as the history of almost every offence against the law of God, and the sacrifice of Jesus Christ. "..Get thee up; wherefore liest thou thus upon thy face? Israel hath sinned, and they have also transgressed my covenant which I commanded them.." The failures of God's people are often automatically put on the Lord for some imagined "Mystery" of His will, why He would let them fall. But see how God answers, and make no mistake; if we fall before our enemies, its because we have sinned! God is a God of justice. Achan paid the price for disobedience. Achan's sin: it was a sin; Achan stole from God. That's made very plain. Ai: in the 1st place, Joshua did NOT pray for God's guidance before Ai. Had he prayed God would have told him of Achan. Joshua was 'presumptuous'. God tells what we need to know, but we have to ask him - "is there anything I need to know before this battle?" That's why Ai defeated them. God told joshua to kill every man ,women, and child because they knew not of the living God but served other gods. If joshua would have only killed the men the children would have still grew up to hate God. Same as the flood and sodom. They had became so evil there was no hope for them. Achan was not killed because of stealing he was killed for his diobedients to God. There had to be an example of what happened to those who sinned against God. Just like when the church was started in acts chpt.5 Anninias and his wife sapphira held back from God and was struck dead. There has to be an example made or people will not respect the Lord.God is a loving just God, But he also brings down his wrath upon the wicked. When Joshua was leading the children of Israel into the land of God s promise, they lost the blessing of God when Achan sinned against God. Joshua was burdened because they had lost God s blessing and he got on his knees. But, the answer wasn t prayer, the answer was obedience. God told him to stop praying and to deal with the sin. What Do You Think of Joshua 7?